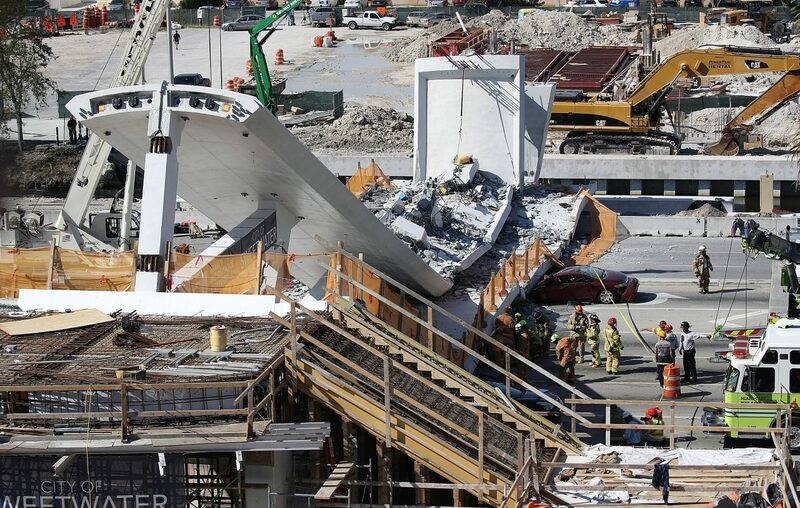 MIAMI – The graceful pedestrian bridge was swung into place Saturday. Heralded as a triumph of “accelerated construction,” the bridge would allow pedestrians to safely cross eight lanes of traffic separating the campus of Florida International University from the small city where many of the students lived. Five days later, around midday Thursday, the bridge collapsed in a pile of 950 tons of metal, concrete and dust, before ever opening to pedestrians. At least four people were killed, according to Miami Fire Chief Dave Downey. Some reports put the number of dead at six to 10. Many of the cars were caught under the bridge when a stoplight turned red at a nearby intersection. Eight cars could be seen poking out from the rubble, in a scene that resembled the aftermath of an earthquake. “I heard what sounded to me like a sonic boom from an aircraft which shook the ground below,” said Kurt Baker, a student at the university who had just exited the Florida Turnpike. Drivers leapt from their cars to help pull people free, but quickly realized they could only save the people in cars that were half crushed, said Lynell R. Collins, who had been about to turn onto the street in his pickup. The others were gone. At least nine people were pulled from the rubble, Downey said. Ten trauma patients were taken to Kendall Regional Medical Center, two of them in critical condition, hospital officials said at a news conference. Hours after the collapse, rescue workers were seen removing a stretcher with one body on it, and it seemed likely that there would be others. Rescue workers, joined by construction workers, desperately dug through the rubble looking and listening for signs of life, using listening devices, fiber optics and dogs. Officials said they expected the search to continue through the night, working carefully because part of the structure was still unsafe. The walkway had a span of about 174 feet over Southwest Eighth Street, a major thoroughfare that crosses the county and separates the FIU campus in western Miami-Dade County with the city of Sweetwater. The walkway was built adjacent to the street using a method called accelerated bridge construction. It was then driven into its perpendicular position across the road by a rig in about six hours Saturday, while students from the university’s engineering and architecture programs watched. On the FIU website, a time-lapse video shows the intricate raising of the bridge before dawn Saturday to the accompaniment of triumphant music, a sign of the university’s pride in the construction. At the time, Mark B. Rosenberg, president of the university, hailed it as a symbol of the bond between the university and the surrounding community. Accelerated construction is a well-regarded method of erecting bridges that avoids the long months of street closings when the structure is built over a road or river. Instead, parts of the bridge are prefabricated away from the site. In some cases, including with the FIU bridge, the entire span is built before being lowered into place on its supports. A national database of accelerated bridge construction projects, which is maintained by Florida International University, lists more than 100 such projects across the United States. The National Transportation Safety Board rushed investigators to the scene Thursday, for an investigation that is likely to focus on the design and construction of the bridge, as well as the methods used to put it in place. Bridges made with the accelerated techniques are not more at risk for collapse than others, but moving them into place causes different stresses than what the bridge would normally have to withstand, said Andy Herrmann, a former president of the American Society of Civil Engineers. Funding for the $14.2 million bridge, connecting plazas and walkways was part of a $19.4 million Transportation Investment Generating Economic Recovery grant from the Department of Transportation. Thursday’s accident was not the first time the company building the bridge, Munilla Construction Management, known as MCM, has faced trouble with a project. A lawsuit filed this month accused the company of shoddy construction work on a temporary bridge it built at the Fort Lauderdale International Airport. An agent with the Transportation Security Administration, Jose Perez, fell walking across the bridge and broke several bones, said his lawyer, Tesha Allison. The company has not responded to the suit. In 2016, a judge ordered construction on a bridge in Broward County to stop until Munilla could prove that it was not causing damage to a historic building. A lawyer for the family-owned business, Daniel Munilla, did not immediately respond to a request for comment Thursday. Calls to the company were met with an announcement in which someone read the statement the company had posted on Facebook. “MCM is a family business and we are all devastated and doing everything we can to assist,” the statement said in part. MCM’s partner, FIGG Bridge Engineers, put out a statement of condolence, adding, “In our 40-year history, nothing like this has ever happened before.” Both said they would cooperate with any investigation. Passers-by were stunned by the collapse. Jonathan Munoz, 21, a junior premedical major, said he had just driven under the pedestrian bridge and entered a nearby parking garage when he heard a loud bang. He thought he had hit something as he looked for a parking spot, so he pulled over and checked his car. A few minutes later, he got a frantic call from his girlfriend, who had been with him in the car moments earlier. She was near tears. “Jonathan, the bridge collapsed,” she said. He ran over and saw a construction worker with blood coming out of his neck. Collins, the driver of the pickup, said he stayed to help for about 10 or 15 minutes until police came and ushered people out. A driver trapped in a car half-buried under the bridge was rescued by bystanders using a two-by-four, Mesa said. Shortly before 5 p.m., firefighters could be seen moving a stretcher on wheels into position near one of the crushed cars. They did not appear to be in a great hurry, indicating that the victim in question had died. The process was likely to be repeated as the evening wore on. Other firefighters were sawing large planks of wood, suggesting that they intended to prop up the collapsed bridge while they extricated victims. By late afternoon, a large crane was brought to the site on the west side of the broken bridge. Another crane that had been used in its construction was taken away Thursday morning, Luis Bottari, a campus mail carrier, said as he watched the recovery efforts from the fourth-floor vantage point of a nearby parking structure.